In this critical first year, your baby’s brain and eyes begin to coordinate images and remember what they’ve seen. You can participate in your newborn’s eye development and health as a normal part of your time with your baby. To your baby, everything is new and exciting. And your baby’s vision is one of the most important links to their new world. In their first weeks and months, babies learn to use their eyes – and their eyes actually “learn” how to see. While each eye has the physical structure it needs to begin to see, the two eyes haven’t learned to work together yet. The best way to help keep your baby's eyes healthy is through regular professional examinations. Chances are your health care professional will examine your baby’s eyes in one of the first few visits. This simple examination will determine if there are any early vision or eye concerns. Babies should have a comprehensive eye exam by six months. A balanced diet can make the difference in overall health and wellness. 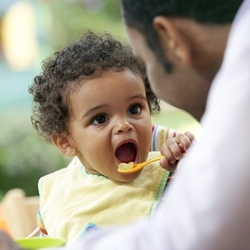 While your baby will not be eating from all four food groups for awhile, knowing which foods contain the nutrients that may promote eye health can help you start making these choices as part of your diet, too. It’s never too early to be concerned about eye safety because babies are naturally curious. While it’s true most accidents happen at home, that doesn't mean you can relax when you leave the house. Most places you go – including playgrounds – aren't likely to be baby-proofed, so it is up to you to help provide safety. If you think your baby's eye might be injured, seek immediate, professional medical attention.